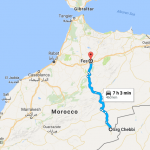 This page presenting you with 2 Days Erg Chebbi Merzouga dunes. Erg Chebbi is one of Morocco’s two Saharian Ergs – large seas of dunes formed by wind-blown sand. The other is Erg Chigaga near M’hamid. 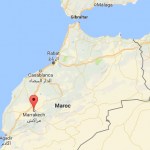 The dunes of Erg Chebbi reach a height of up to 150 meters in places and altogether it spans an area of 50 kilometers from north to south and up to 5–10 kilometers from east to west lining the Algerian border. 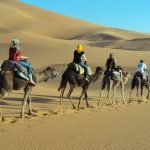 See the details of 2 Days Erg Chebbi Merzouga trip. Day 1: Marrakech-Tizi N’tichka Pass-Ait Benhaddou-Ouarzazate-Kelaa M’gouna-Boumalne Dades-Tinghir-Erfoud- Desert. 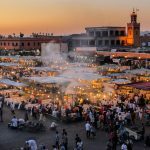 Today, we pick you up from your Hotel in Marrakech, and departure to Ait Benhaddou over the mountains of high Atlas passing through the Tizi N’tichka pass (2260 m in altitude), visit the Kasbah of Ait Ben Haddou and stop for lunch in a local restaurant along the way, later we will drive to Ouarzazate and stop near the atlas film studios for a photo then continue to the city center for a panoramic view of the kasbah of Taourirt, Kalaa M’gouna , Boumalne du Dades, along with a panoramic view of Dades valley. Later on, we will continue to Todra gorges via Imider and Tineghir. Stopping along the way for photos and admiring the views. 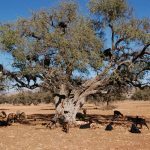 Arrival to Todra Gorges to enjoy its marvelous Canyons views, later on continue to Tinejdad and have then Erfoud. We will continue to the captivating dunes of Erg Chebbi, these dunes are called also Merzouga Dunes. Arrive to the hotel and get ready for a camel trek for an hour and half to enjoy the sunset. While on the back of your dromedary, you will continue to the camp for an overnight in traditional nomad tent. 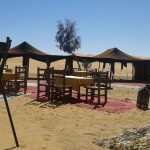 After enjoying the amazing sunrise among the sand dunes and having breakfast, you ride back your Camels to the Auberge. 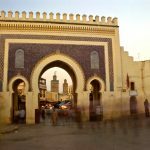 You will travel back directly to Marrakech and have few stops on the way. 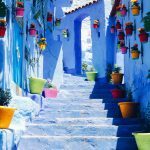 Enjoying your lunch then continue to the red city of Marrakech over the mountains of high Atlas passing through the Tizi N’tichka pass (2260 m in altitude). 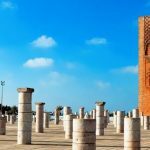 Arrival to Marrakech and Drop off in your accommodation in Marrakech. 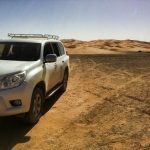 Your short desert tour of 2 Days Erg Chebbi Merzouga dunes end.